All eyes will be on the bride, of course. But, the groom and his entourage should be able to shine a little too. We have classy and classic tuxedos available to rent to help your man look his best. 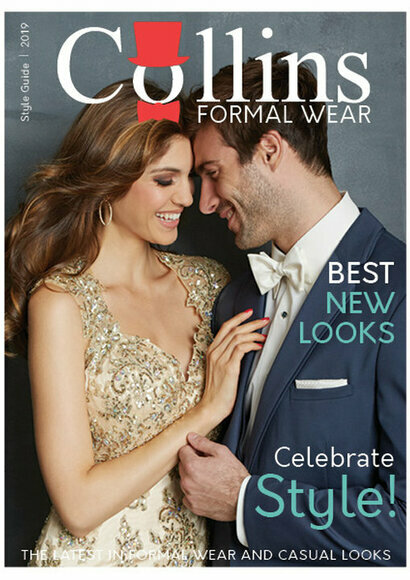 Collins has your formal wear needs covered! Experience Canada’s most modern formal wear collection for yourself! Black Tie event? We have you covered. Something less formal for a beach wedding? We’ve got that too. Tuxedos and suits in light grey, dark grey, navy, white, red, blue, ivory and of course black, with Canada’s widest rental tie and vest collection to match your needs. Check out Collins latest in formal and casual wear! Introducing a new line of Suits in five colours that you can either rent or buy! No matter what you decide, all the suits will match. Think you want to rent but then change your mind and decide to keep it? Just pay the difference and the suit is yours! You can decide at any point in the process if you want to love it or lease it. Check out the new Love It or Lease It Catalogue! Contact us today to get your groomsman fitted! Ask us about our deals for the groom!